On January 1, 2020, the International Maritime Organisation (IMO)’s rules on sulfur emission are due to come into force – a move which will have a monumental impact on the shipping industry. This legislation will ban any ship from emitting more than 0.5% of sulfur in its fuel, a cut of almost 3% from the current level. Therefore, planning for the implementation will be one of the industry’s biggest challenges in 2019. In this exclusive insight, PTI has explored the reasons behind the new rules and how some of the world’s biggest carriers are preparing for them. The IMO’s motivation is clear – the shipping industry, while invaluable to the global economy, is one of the biggest polluters in the world. It contributes 17% of the world’s CO2 annual emissions and 8% of its sulfur output. The former could, according to the EU, could rise to 50% by 2050 unless action is taken. This is because, as things stand, the shipping industry relies on sulfur-heavy heavy fuel oil (HFO) and has done for decades. Estimates vary but it is believed that the IMO’s regulations will cost the shipping industry between US $60 – 200 billion. Carriers have devised various ways of complying with the laws, which may turn out to be beneficial to business, as well as the environment. The biggest has been a move towards new fuels, such as liquefied natural gas (LNG) which has the potential to reduce shipping times and improve efficiencies. Carriers have also been searching for eco-friendly innovations. Japanese carrier MOL, which recently merged into Ocean Network Express (ONE), for example, unveiled plans six new technologies in August 2018. These included water treatment systems, sulfur scrubbers, LNG-fuelled vessels and even plans to use electric sails on container vessels, which it hopes to launch by 2020. This is just one of the big innovations that the industry is looking at. Others include new hybrid cleaning systems, which will reduce the output of dirty chemicals, and even cryptocurrencies. On December 5, the world’s biggest carrier A.P. Moeller-Maersk announced plans to go above and beyond complying with the IMO’s 2020 rules when it set a target of having carbon neutral vessels on the seas by 2030. That is part of the company’s plans to achieve a completely carbon-free fleet by 2050 and called on the rest of the industry to “join forces” and find new ways of keep trade moving while protecting the environment. 2019 will be dominated by the shipping industry’s preparations for January 1, 2020. It has already inspired a raft of technological innovations which could become fixtures of the sector for years to come. 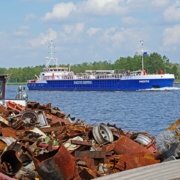 Ships will be allowed to deliver all garbage when paying a fixed port waste fee, without port-specific limitations towards the volumes delivered. This will guarantee that ports keep investing in efficient port reception facilities, which are to be supported by transparent cost recovery systems. “This agreement is an important step towards the further safeguarding of the marine environment, the working space of our shipping industry,” said Martin Dorsman, secretary general of European Community Shipowners’ Associations (ECSA). 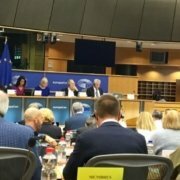 Although the directive mainly focuses on European ports and ships entering those, the EU legislators clearly recognise the importance of ensuring smooth operation of maritime traffic between EU and non-EU ports, stated ECSA. The organisation pointed out this is demonstrated by the alignment of the EU legislation with the IMO’s International Convention for the Prevention of Pollution from Ships (MARPOL), which has been amended since the current directive was adopted in 2000. “We are looking forward now to take up the work again which started many years ago in the port reception facilities subgroup of the European Sustainable Shipping Forum ESSF and are eager to continue the good cooperation with the NGOs, the EU ports, the EU legislators and the Member States in a new expert working group,” emphasised Mr Dorsman. 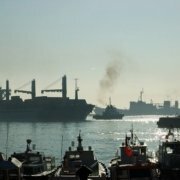 Barcelona City Council has backed an initiative to establish an Emission Control Area (ECA) in the Mediterranean Sea (Med-ECA) to limit air pollution produced by ships and is urging the Spanish Government to support the cause. Alianza Mar Blava, Transport & Environment, Ecologistas en Acción of Catalonia and Plataforma por la Calidad del Aire have congratulated Barcelona City Council for subscribing to the initiative led by the CleanCruiseNetwork alliance. 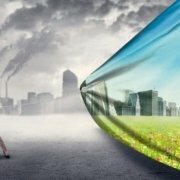 The initiative calls for the Spanish Government to actively support the creation, as soon as possible, of a Med-ECA covering all major air pollutants, such as sulphur and nitrogen oxides, but also particles and black carbon, to support efforts in this direction initiated by France and other coastal states of the Mediterranean. Spain is also being asked to coordinate with the European Commission, with France and the rest of member states of the European Union (EU), as well as with non-EU coastal states, to ensure the creation of said Mediterranean ECA and, subsequently, once created, to support the implementation of a cooperative cross-border management of the same. Additionally, it is being asked to urgently implement the relevant measures in the Ports of the State to ensure the reduction of emissions from ships, forcing them, once they are docked, to connect to the electricity grid for daily operation, among other measures. The establishment of a regulatory framework for ECAs in the North Sea, the Baltic Sea and the English Channel has led to immediate improvements in air quality of up to 50% since 2015 and associated socio-economic benefits valued in billions of euros. 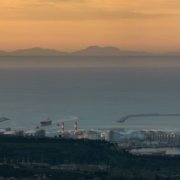 A project which will promote the use of LNG as fuel in Spanish ports has been selected by the European Commission (EC) for funding. The EC will contribute approximately EUR3m to the EUR14m ‘LNGHIVE2: Infrastructure and Logistics Solutions’ project to encourage LNG in maritime and rail transport, coordinated by energy company Enagás and promoted by the Spanish Govenment’s Ports of the State. The project includes the adaptation of the regasification plants of Huelva and Sagunto (Valencia) so that they can offer LNG supply services as fuel. With an expected end date of 2022, the initiative will also introduce LNG in the ‘Green Railway Corridor’ between the Port of Huelva and the railway terminal of Majarabique, of ADIF, in Seville. In particular, the project includes the construction of a LNG supply station in said terminal and the conversion of a diesel traction locomotive to LNG. Aside from Enagás and Ports of the State, six partners are participating in the project, including the Port Authority of Huelva, RENFE Mercancías, ADIF, Saggas, Marflet Marine and Valencia Port Foundation. ‘LNGHIVE2 is part of the institutional strategy of deploying LNG supply points in ports and associated market development, promoted by the Ministry of Public Works through State Ports. Under this strategy, a Balearia initiative consisting of the conversion of five vessels for the use of LNG as fuel has also been selected. LNGHIVE2 is one of the measures of the National Action Framework for Alternative Energies in Transport approved by the EU’s Council of Ministers in December 2016 and aims to comply with Directive 94/2014 of the European Commission, which represents a clear commitment to alternative fuels in the transport sector. Enagás is currently also coordinating CORE LNGas hive, led by Puertos del Estado. Ships without scrubbers will be unable to carry fuel with a sulphur content higher than 0.5% from March 2020 after the move was adopted by IMO’s Marine Environment Protection Committee (MEPC) last week. The move is seen as a key step in improving the enforceability of IMO’s global sulphur cap (to be implemented from 1 January 2020), meaning that ships will not be able to carry non-compliant fuel unless they have the means to comply with the sulphur limit. It is just one of several measures supporting the new sulphur regulations to have been agreed at the seventy-third sitting of MEPC. The committee also approved guidance on ship implementation planning as part of a set of guidelines being developed by IMO to ensure consistent implementation. The g guidance includes sections on risk assessment and mitigation planning; fuel oil system modifications and tank cleaning; fuel oil capacity and segregation capability; procurement of compliant fuel; fuel oil changeover planning; and documentation and reporting. Further guidance approved by MEPC includes best practice for fuel oil suppliers, which is intended to assist purchasers and users in assuring the quality of sulphur compliant fuel. The guidance pertains to aspects of the purchase up to the loading of the purchased fuel. A proposal suggesting an ‘experience-building phase’ to allay concerns about the safety of low-sulphur fuels was defeated, despite receiving some strong support. However, MEPC invited proposals to the next sitting (in May next year) on how to enhance the implementation of regulation 18 if Marpol annex VI, which covers fuel oil quality and availability. The regulation requires parties to ‘take all reasonable steps’ to promote the availability of compliant fuel oils, as well as informing IMO of the availability of compliant fuel oils in its ports and terminals. Parties are also required to notify IMO when a ship has presented evidence of the non-availability of compliant fuel oil. Ship owner association BIMCO declared itself ‘very satisfied’ with the developments. “The industry retains a fixed implementation date, which is important, while we at the same time address the safety concerns,” said Lars Robert Pedersen, deputy secretary general. He added that the association would work diligently to craft proposals that will enable the shipping industry to harvest experience to reduce the risk of safety issues associated with sulphur compliance. 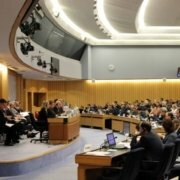 The International Chamber of Shipping (ICS) welcomed progress at MEPC73 but noted that “numerous complex issues that need addressing urgently by IMO, both at the MEPC next May and by the Maritime Safety Committee (MSC) in December”. A detailed paper has already been submitted to MSC calling on governments to better enforce fuel quality. “In view of the enormity of this major change it’s likely there’ll be some teething problems immediately before and after 1 January 2020,” said Esben Poulsson, secretary general, ICS. “Many industry associations have raised legitimate concerns about fuel availability, safety and compatibility of new fuels – a particular problem for those in the tramp trades. The International Maritime Organization (IMO) has published a new set of toolkits for shippers and ports, to assess ways of reducing emissions across the maritime sector. The Ship Emissions Toolkit and Port Emissions Toolkit have been developed under the Global Maritime Energy Efficiency Partnerships (GloMEEP) Project, the IMO working in collaboration with the Institute of Marine Engineering, Science and Technology (IMarEST) and the International Association of Ports and Harbours (IAPH). Astrid Dispert, GloMEEP Technical Adviser, has stated that the new guides will help countries seeking to develop and strengthen regulatory frameworks related to the prevention of air pollution, as well as the reduction of greenhouse gas emissions from ships. Dispert said: “Both the ship and port emission toolkits provide practical guidance on assessing emissions so that a national emission reduction strategy for the maritime sector can be developed. According to a statement, both toolkits have been developed through extensive testing and feedback, gathered from their practical use during national and regional training activities. Both toolkits feature decision support tools for evaluating emissions reduction opportunities, including guidance for conducting a rapid assessment that generates both quantitative and qualitative information. Dispert added: “Ports and shipping are intrinsically linked – as such, efforts to reduce maritime emissions need to extend beyond seagoing ships alone. 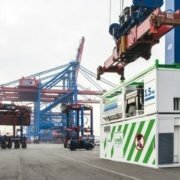 A group of the world’s leading port authorities have announced the launching of the World Ports Climate Action Programme, an international initiative with the objective of fighting climate change. It will focus on a number of key areas, all based around improving supply chain efficiencies and cutting emissions. Signatories include the port authorities of Hamburg, Barcelona, Antwerp, Los Angeles, Long Beach, Vancouver and Rotterdam. These will include accelerating the development of commercially viable sustainable low carbon fuels for maritime transport and infrastructure for electrification of ship propulsion systems. The agreement will also concentrate on pursuing efforts to fully decarbonize cargo-handling facilities in ports, and research other renewable power 2-ship solutions. In a joint statement, the authorities of the Port of Rotterdam and the Port of Antwerp urged all companies in the shipping industry to reaffirm their commitment to the Paris Agreement, a global initiative aimed at combatting climate change. Allard Castelein, CEO of the Port of Rotterdam Authority, and Jacques Vandermeiren, CEO of the Port of Antwerp Authority, commented on the Programme: “The Paris Agreement has set a clear target: we need to limit global warming to well below 2°C. “It is vital in this context to reduce the emissions generated by maritime transport. As critical hubs in the global maritime transport network, I am convinced that ports can make a significant contribution. Liquid hydrogen could get a leg up from the industry’s experience with LNG propulsion,writes Stevie Knight. The bad news is that while your shipboard or bunkering design might look very similar, the components, like valves, hoses and piping are not necessarily interchangeable: “It’s a smaller molecule and it can escape through joints or seals that would retain LNG,” he adds. “You’d have to look to see if the current components would be suitable – but most likely I think you’ll have changes in your equipment,” says Dr Wuersig. And, he adds, it’ll work out quite a bit more pricey. More, LNG developments can’t help much here as at this point the design deviates sharply. Two characteristics of LH2 are low density and low boiling temperature: together these demand an extremely low heat flux through the tank walls. Dr Wuersig explains that the normal 40cm LNG insulation “just won’t work”. He says a moderately large LNG tank could lose 0.2% of its total volume a day but “store hydrogen in the same kind of tank and you would actually lose 5% of the contents every day to vaporisation”. A multilayer approach with an evacuated space between the inner and outer shell is already being used to keep LH2 and liquid helium cold in the industrial sector, but there’s only one project so far – for a KHI-designed ship – that’s being scaled for the marine trading world, although the eventual development of larger vessels will have an advantage because higher capacity tanks exhibit a lower boil off rate. There are other dissimilarities between LNG and LH2. Dr Pratt says when it comes to bunkering, “the biggest difference is the much colder temperature of LH2” and explains that unlike LNG, H2 is actually colder than oxygen or nitrogen. 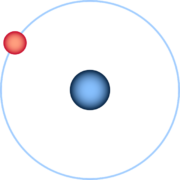 While LNG can hover at -163°C, liquid hydrogen needs to be kept at -253°C. So, “even through vacuum insulation you will get very cold temperature on the outside of the pipe that can freeze or condense oxygen and nitrogen out of the air”. For practical purposes, not only do you need a very high grade of insulation, “there will be some drip pans and possibly restrictions on fuelling over asphalt to prevent any fire possibility as a result of having pure oxygen forming around the pipes”, said Dr Pratt. Hydrogen is already the chosen option for a number of smaller vessels with an environmental agenda: “Norway is working on constructing hydrogen fuelled vessels, mostly battery hybrids, as it is aiming for zero emissions in the fjords,” says Dr Wuersig. 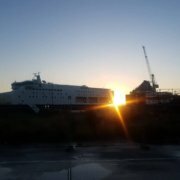 The autonomous Energy Observer, which electrolyses seawater for fuel, has recently set off on a six year missionand Dr Pratt is himself pursuing the build of a small, multipurpose freight carrier for California through GGZEM. But, the most obvious question is: would hydrogen be a useful alternative for big ships? First of all, bigger ships will need to bunker liquefied, not compressed, hydrogen. Dr Pratt says: “In general, it’s always better to go to LH2 if you can get it and afford the cost difference – it gives you more range or longer times between refuelling than gas, no matter what the size of the vessel.” This obviously needs the development of infrastructure – and here again, the industry experience with LNG will be invaluable – but on which kinds of vessels could it find a home? Sandia’s research Practical Application Limits of Fuel Cells and Batteries for Zero Emission Vessels* (at the time lead by Dr Pratt), has dug deep into the nitty-gritty, with a look at no less than 14 possible ships and their associated routes. This takes a detailed look not just at the power required, but whether the ship could actually accommodate the necessary architecture – helped of course by the fact that fuel cells, unlike a shaft drive engine, can be positioned in a variety of areas. One of the 14 studies was the 397m Emma Maersk. Despite the large power and energy requirements, the research showed that the ship is able to hold a fuel cell powerplant using liquid hydrogen, scaled for a single voyage from Tanjung Pelepas, Malaysia to Port Said, Egypt with a total voyage time of 256hr at an average speed of 19.6 knots and average shaft power of 36.1MW. This would require bunkering with 616t of LH2. Likewise, a detailed look at Colombo Express (335m) showed that it could carry out three of its typical, single trips between Singapore and Colombo, Sri Lanka, fuelled with 183t of LH2. The devil is in the detail. Dr Wuersig points out that hydrogen has a low energy density by volume (though not by weight) which is only around 40% of that LNG. As already pointed out, LH2 isn’t heavy, but one tonne of it takes up over 14,128 litres by volume: this means 8,500m3 of LH2 for that Emma Maersk journey on LH2. Could it be done? Yes, but it’s tricky as deep sea routes aren’t made up of single journeys. Taking the kind of operational profile that’s used onboard the latest LNG-fuelled CMA CGM ships which require an 18,000m3 tank installed underneath the wheelhouse, “you’d need 50,000m3 instead” he says. Further, he estimates the Asia-Europe string is 40 days: therefore the Emma Maersk would need around 72,000m3 to transit this on LH2 alone. However, the case is different for shorter runs: according to the Sandia study, Colombo Express fairs better: 833m3 for that Singapore-Colombo single trip (2,500m3 for three journeys). More, both agree that when it gets to ropax crossings like those between the east coast of the UK and Rotterdam, there’s obviously an advantage as it’s a short, regular, point-to-point journey “and you do need the infrastructure to deliver the hydrogen, something that’s caused other viable projects to fail” says Dr Pratt. Certainly Sandia’s investigation showed that Pride of Hull has room for a fuel cell and LH2 tank scaled for 15.8t of fuel, yielding no less than five crossings on just one fill up. Dr Wuersig adds there are many other areas that might see hydrogen as a viable alternative for slightly larger ships on a regular run: “Baltic carriers for example, could benefit because they could be filling up every few days; then there’s the US-Hawaii traffic on the Jones Act ships.” More, he adds that Chinese river traffic is presently looking LNG, but there could soon be a lot of renewable energy capacity in China that might not all be easily absorbed by the grid “which might change the maths when it comes to the generation of sustainable fuels”. It’s not just China, some of the windfarms and renewable arrays around offshore Europe are presently considering generating hydrogen in their off-peak periods. More, Sandia’s study on the offshore supply vessel Maersk Frontier showed it could take on no less than 28 single trips (14 round trips) on the 166nm journey between home port in Aberdeen UK and the Janice offshore facility at an average 9.7 knots, so LH2 could be worthwhile for wider ranging applications. Even closer to realisation is Zero-V, a coastal research vessel concept by Glosten, Sandia and the Scripps Institution of Oceanography that’s just been given AIP by DNV GL. Supported by bunkering of its 11,000kg capacity tanks at four ports along the US West Coast, it will have a 10kn range of 2,400 nautical miles. However, another niggling detail presents itself: LH2 is also expensive to create: “At present production costs alone come to around $2.00 per litre, that’s without the base feed,” says Dr Wuersig. And no, it probably won’t get a lot cheaper – it’s down to the physics. The amount of energy required for liquefying hydrogen takes a huge 30% slice out of the total, compared to about 5% for LNG. * Practical Application Limits of Fuel Cells and Batteries for Zero Emission Vessels (http://energy.sandia.gov/wp-content/uploads/2017/12/SAND2017-12665.pdf). The LH2 demonstrator is not the first long-range hydrogen supply chain project targeting Japan. Last year, Chiyoda Corp started to work on transporting hydrogen extracted from natural gas at an LNG plant in Brunei and delivering it to the city of Kawasaki in Japan – but rather than chilling to -253°C, the hydrogen is bound to a carrier substance and carried in simple chemical tankers which slot neatly into the existing supply-chain technology. No need for expensive cryogenics. Transforming hydrogen into an ambient liquid means binding it with a carrier substance, such as toluene, converting it to methyl cyclohexane (MCH) by hydrogenation: three H2 molecules attach to every molecule of toluene. At the other end it’s reconverted to hydrogen gas, the toluene being recovered for the next round. Professor Kazuyuki Ouchi, University of Tokyo explains that the density, while not quite as high as LH2 (500 times that of hydrogen gas, as compared to 700 times) “it is of the same order” so yields a tolerably similar output. Interestingly, the project, which is expected to start production in 2020 with an output of 210 tonnes (enough to fill up 40,000 fuel cell vehicles), has Mitsubishi Corporation, NYK and Mitsui onboard. More, while it’s starting with a fossil fuel base, Chiyoda believes that production will eventually move to renewably-derived hydrogen.